Our glass transporting vehicles are fitted with full length internal glass racks that allow you to make the most use of the vehicle length for transporting Glass, Windows, Frames and other oversized items. These racks are also suitable for supporting Marble Panels, Work Tops, Doors and other items that require fixed support during transportation.The racking system makes use of spring loaded poles and straps, creating a versatile method for restraining your precious goods. Our vehicles are always kept clean and tidy – a condition of hire – and so have proved invaluable to clients wishing to support Art, Sculptures and other delicate items. Our Long Wheel Base High Top vans are fitted with a full length external frail racking system. These racks hold the glass panels firmly in place using the same easy to install spring loaded poles that you’ll find on our internal frail systems. These external van racks can also be used to transport other large flat items such as Garage Doors. At over 3 metres in length and more than two and a half metres in height, the external van rack makes good use of the long wheel base high top body. The lower rack support plate is hinged, making it easy to reduce the overall width of the vehicle when the external frail is not in use. 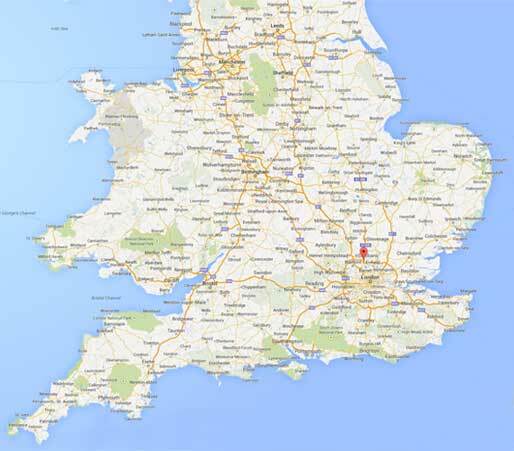 As our business has grown in recent years, so has our delivery area. Originally we offered glazing van delivery in North London, South London, East London, West London and all the surrounding counties. 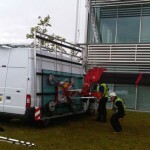 Nowadays, we are able to deliver our self drive glass carrying vans much further afield and offer a nationwide service. Please contact us with a deliver address postcode for a quotation. Delivery costs start at just £40.00 + vat each way. Hertfordshire, Bedfordshire – Beds, Essex, Middlesex – Middx, Buckinghamshire – Bucks, Kent, Surrey, Cambridgeshire – Cambs, Oxfordshire – Oxford. 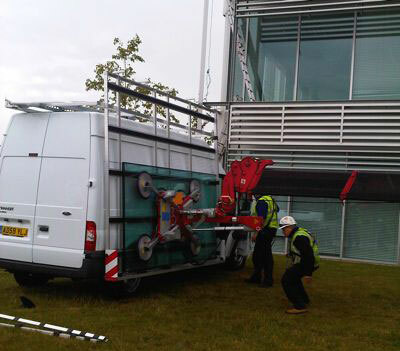 Caught in the act – One of our vehicles being used during the installation of heavy glass panels, using some of the latest labour saving technology. Having ‘White Label’ vehicles with no hire company branding or logos, makes our glazing vans an ideal solution for for short term hire without affecting the image of your own company. Image provided by our client – The Glazing Face – and reproduced with their kind permission.